PALO ALTO, CA -- (MARKET WIRE) -- August 30, 2005 -- Nanosys, Inc. today announced the issuance of U.S. Patent Nos. 6,890,777 (the '777 patent) and 6,914,265 (the '265 patent) entitled "Quantum Dot White and Colored Light Emitting Diodes," by the U.S. Patent and Trademark Office. These patents, exclusively licensed from the Massachusetts Institute of Technology, cover the fundamental technology to allow semiconductor quantum dots, or nanocrystals, to be used as down converting phosphors for white and colored light emission. In addition, these patents cover critical features of quantum dots, including fundamental new compositions of matter to significantly increase performance and capability. The technology described in the patents is fundamental for developing quantum dots for numerous applications including: displays, lighting, and spectral encoding. Quantum dots, or nanocrystals, are known for producing extremely pure colors when electrically or optically stimulated. In contrast to traditional semiconductor materials, which are often bulk in form, quantum dots can be easily blended with polymers, gels, or implemented into porous films to produce devices such as LEDs and electronic displays. Quantum dots offer many advantages over conventional lighting or display materials. For example, unlike traditional materials where changing color can only be achieved by using different materials, the color spectra of quantum dots made from a single material can be precisely "tuned" by just controlling their size. The '777 and '265 patents complement Nanosys' other patents including U.S. Patent Nos. 6,322,901, 6,861,155, and 6,864,626 which cover some of the earliest work in basic core shell nanocrystals for highly efficient light emission. 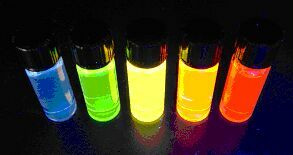 The photograph shows bottles of quantum dots fluorescing from a single UV (ultra-violet) light source; all made from a non-heavy metal containing material; and displaying unique full-spectrum colors due only to their size difference. This allows Nanosys to utilize a single material system for a wide range of products from color displays for computers and televisions to LEDs for white or colored lighting applications.